Benalmadena is one of the most popular holiday resorts on the Costa del Sol of Spain, with a variety of tourist attractions, including Tivoli World, Selwo Marina, Sealife Aquarium and a popular cable car as well as it’s fabulous beaches. Below we guide you on the most important tourist information such as where to go and what to see in order to make the most of your holiday. I’m sure you want to know where the best bars, clubs, restaurants and beaches are – don’t you? So where does the name Benalmadena originate from? Well it is thought to derive from the Arabic ‘Ben-al-madina’, meaning ‘Children of the Mines’, because many centuries ago, iron ore was mined in the area. Up and down the Costa del Sol you will see a lot of Arabic (the Moors) influences. Benalmadena has a population of approximately 60,000 people and is situated in the province of Malaga in the Andalucia region of Spain – our Benalmadena map page helps you get there and find your way around. Benalmadena is actually divided into two – Benalmadena Costa is the beach area where all the tourists flock to. This purpose-built area stretches for 8 km along the coastline with steep mountains behind. We can definitely describe this as a high-rise area full of hotels and apartment blocks. Naturally all the amenities and facilities you would require such as bars, restaurants clubs and shops are here, nevertheless if you are looking for a more relaxing and traditional experience of Spain, Benalmadena is definitely not for you. There is certainly plenty of variety in the restaurants and the types of food served here. Try some traditional Spanish foods such as tapas and paella. If you want to play it safe you will find lots of international restaurants as well as favourites such as fish and chips, Indian restaurants and Chinese restaurants. Where is the best restaurant in Benalmadena? You must book ahead – Telephone: +34 952 569 466. Probably the most popular area is the Puerto Deportivo marina which has been tastefully developed with a real luxury feel to it. Here you will find plenty of designer shops, fancy restaurants such as Jacks American Brassarie, bars and nightclubs. The marina has won the award of best marina in the world several times and it has a feel of Venice because it has many bridges over to man-made islands where people live in luxury apartments. See our dedicated Benalmadena nightlife page to find out which are the best bars and clubs to go to for a great night out. The marina itself has space for over 1,000 boats and yachts, you can take boat trips here to Marbella and Fuengirola or enjoy some booze-cruise type sailing excursions, speed-boat rides and fishing trips. Benalmadena Pueblo is set up high on the mountain overlooking Benalmadena Costa. This is of course how Benalmadena started – a traditional Andalucian Spanish village three kilometres inland from Benalmadena Costa at a height of 200 metres above sea level. It retains the typical postcard images of whitewashed houses with narrow cobbled streets that you would expect to find. A visit here makes a nice change from the hustle and bustle of the beach area. Try eating out here in some of the wonderful Spanish restaurants. Head for the centre and the pretty little square of Plaza de Espana with a statue of a small girl (La Nina). The church of Santo Domingo is worth a visit as is the small museum which houses a number of ancient artifacts excavated from the area. Close to the Pueblo is the landmark of a giant Buddhist Stupa topped by a huge gold-coloured dome. Benalmadena is situated between the similar large, high-rise beach resorts of Fuengirola and Torremolinos and is within easy reach of Malaga Airport which is only 12 km (7 miles) away. Use these coordinates for sat nav to find your way here – 36°36′N 4°31′W. There is a regular rail service from the airport to the train station in Arroyo de la Miel. The main bus stop is situated next to the tourist office in Avenida Antonio Machado. From here you can catch buses along the coast to Torremolinos, Fuengirola and Marbella, as well as inland to Mijas and Ronda. The easiest way of getting from Malaga airport to Benalmadena is just to jump in a taxi directly outside the airport terminal. Other airport transfer options would be booking a shuttle bus which is much the same as a taxi. Once you come out of customs and you have collected your luggage you simply go to the transfers desk and you are then taken directly to your accommodation. A private shuttle transfer is usually in a car and a shared shuttle is normally a minibus with a few other passengers which means it takes a little bit longer depending on who is getting dropped off before you. You could also consider hiring a car but Benalmadena has good public transport systems and wherever you are staying you are likely to have enough bars and restaurants on your doorstep to not need to rent a car. If you fancy exploring the area you can always hire a car locally for a short duration. See our Benalmadena car hire page for more details. Of course the fantastic climate and usually reliable weather is a major attraction for tourists with an average temperature of 19°C or 66°F. Do you want to see what the resort looks like? As well as the photos and pictures on this page we have a dedicated webcam page where you can see streaming live images and views in real time. Of course the obvious thing is the beach but being in the sun all your holiday could be a bit much. Break things up by a trip to some of the many theme parks and water parks in this area which is very family-friendly. This is one of the best theme parks in Spain with a great variety of rides and attractions to keep all ages entertained. This amusement park has lots of rollercoasters, merry-go-round, big wheel, water rides and shows. Tivoli World is located in the commercial and residential area of Arroyo de la Miel, which translates as ‘Stream of Honey’. Arroyo de la Miel once a small quiet village has grown to connect Benalmadena Pueblo to Benalmadena Costa. This is perhaps slightly scary for youngsters but equally exhilarating. 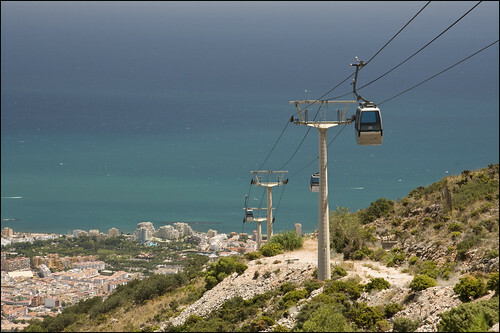 Get on opposite the Tivoli World and you will go up to the 770-metre high Calamorro Mountain. What to do at the top? Obviously the views are just spectacular, not just of Benalmadena, but of the Costa del Sol coast. As well you can enjoy falconry displays and horse riding shows so this is why it is fun for kids too. 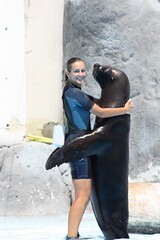 Sealife is located down at the marina and it has an excellent collection of sharks, jellyfish, turtles and ray fish. Next to La Paloma park you will find Selwo Marina whic is the sister park to Selwo Adventure Park (Selwo Aventura). The theme here is to replicate different locations in South America where you can see dolphins, sea lions, crocodiles, exotic birds and snakes. The Butterfly Park of Benalmádena is the largest space dedicated to butterflies in Europe at over 2,000 m2. See over 150 different species. Built in an Asian temple style because in Asia the butterfly symbolizes the soul and spirituality. 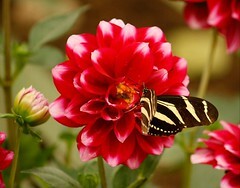 It was also in Asia that 4,000 years ago butterfly farming began. Opening Hours: From Monday to Sunday: 10:00 to 19:00 h.
Butterflies have a lifespan of just two weeks! A short distance west is the four star Torrequebrada Hotel & Casino as well as the 18-hole Torrequebrada golf course. Of course this whole area is nicknamed the Costa del Golf as there are over 40 golf courses within easy reach. Close to here is the naturist (nudist) beach known as Benalnatura. Make sure you see the Torre Quebrada watchtower, Bil-bil Castle and Colomares Castle. La Paloma Park (Parque de la Paloma) is right in the centre of Benalmadena Costa and covers a large area of over 200,00 sq metres. This beautiful park is full of colourful flowers, lake, waterfall and animals such as ducks, geese, peacocks, rabbits, emus and goats. There is a market here on Wednesdays. Benalmadena is also well known for its beaches and there are twelve of them which are well worth a visit. There is 8km of blue flag rated beaches to explore with a number of coves and rocks good for snorkelling. The sand isn’t so great but the beaches are at least well-kept and clean with plenty of facilities. Benalmadena beaches to put on your tourist agenda include the Playa Torre Bemeja, Playa Santa Ana, Playa Arroyo de Miel, Playa Torrevieja, Playa Las Yucas, Playa Viborillas, Playa Aroyo Hondo, Playa Torremuelle, Playa La Perla, Playa La Meorera, Playa Tajo de la Soga and the Playa Carvajal. Which is the best beach in Benalmadena? Malapesquera Beach is probably the most popular and best Benalmadena beach. The location is key – right next to the marina makes it a busy beach and there is lots going on such as beach volleyball and the Nautical centre hires jet-skis and sailing boats. In Benalmadena, you can find the Colegio Internacional Torrequebrada which offers infant education, primary education, secondary education and international baccalaureate in the curriculum. It also provides a number of services that include canteen, school bus, activities abroad, educational excursions and summer camps among others. There are plenty of options in all categories. For luxury choose the 4 star Torrequebrada Hotel & Casino or the Hotel & Spa Benalmadena Palace right in the heart of town and near the beach. Most hotels are 3 star standard. Try the El Greco Hotel in the Los Pintores Tourist Complex. Here you also find the three-star hotels of Velazquez Hotel and Hotel Goya. This is a good location as these hotels have their own swimming pool, there is a nightclub in the complex and you are only 400m from the beach and near the Benalmadena Marina. Apartments such as the Residencia Don Gustavo are a good option if you fancy going self-catering which is handy as you can try a different restaurant each evening of your holiday. Staying near the popular marina is possible at the Apartments Timor Sol, Imperial Apartments or the Hotel Aloha Puerto Sol. Trip to the glamourous tourist resort of Marbella known for its rich and famous residents and visitors. Marbella is the place for shopping and seeing the luxury yachts at the marina. Mijas is a lovely white-washed village in the mountains. Nerja is a pretty former fishing village with caves. Malaga is the main city on the Costa del Sol with the Picasso museum and the Moorish ruins of the Gibralfaro – trains leave every 30 mins. Granada to visit the Moorish Alhambra Palace. Take a trip over the Mediterranean across to Morocco. Day trip to Sevilla (Seville). Go inland to the pretty town of Ronda. Visit the Rock of Gibraltar which is not much further down the Costa del Sol. Thinking of Moving To Benalmadena? 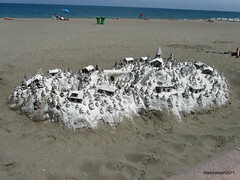 The Costa del Sol coast is still the most popular area for people moving to Spain. We would love to hear from you if you have moved here and now live in the Benalmadena area. Many people would be curious as to how you have got on. Tell us what it is like living in Benalmadena. Do you perhaps think you would have preferred to have moved to another part of Spain? If you are thinking of moving to Spain be sure to see our expat section where we have many stories and interviews. Lisa, what would you say would be the advantages to living in Benalmadena compared to other Costa del Sol towns? Well firstly, it is situated on the direct train link from Malaga airport to Benalmadena. You can reach your destination in just approx. 20 minutes. Benalmadena is broken up into 3 distinct areas: Arroyo de la Miel where the train station is; Benalmadena Pueblo (quaint white washed traditional village) and Benalmadena Costa. Therefore whether you are looking for beach, shops or sightseeing, it has it all. None at all because there are excellent transport links from the top part of Arroyo de la Miel and Benalmadena Pueblo and Benalmadena Costa offers all the beach and activities something to suit everyone! Visit the natural Parque de Paloma, Tivoli World, Sealife centre, open air theatre, Butterfly park, cosmopolitan Benalmadena port, eat tapas in the local bars, relax in local spas and meditate in the Buddhist temple and of course swim in the sea! Can you give us some insider tips to the best bars or restaurants in Benalmadena? There are too many to mention to suit every person tastes, whether a la carte, tapas, British, Scandinavian, Dutch, Chinese, Italian, Thai, steak houses… the only insider tips are visit as many as you can and enjoy the culture. Yes. There is a private hospital called Xanit, local surgeries, dentists, opticians, physcians of all kinds in nearly all languages nobody need worry about being taken cared of. An array of shops to suit everyone from health food shops to shoe shops. Smaller villages such as Nueva Torrequebrada and Torremuelle are great for golf, beach coves even a nudists resort. What a sad question which I know people ask all the time but yet when buying in their own country do they ask this question, of course there are opportunists everywhere including in your own back yard! The funniest question we get asked a lot of ´why are there bars on the windows, is it because of crime´ and the reply is simple it is the Spanish way of building! It can be for many reasons some extraordinary and some very ordinary like air flow! Coming onto buying property in Benalmadena, what is the market like now in terms of prices going up, or down or staying the same? Prices seem to have leveled out but we are seeing a rise very slowly in prices each quarter. This is an excellent time to buy as prices are realistic. There are many properties to buy for the keen investor from the banks or from owners looking for a quick sale. There are too many to mention ranging from your beachside urbanizations to your country urbanizations. Some are gated some are not. Most have communal pools and gardens. Some have 24hr reception service while most have security guards or security service. Some have underground parking while others have communal parking. There are so many to choose from again something to suit each person’s needs. How much are the typical property prices in Benalmadena for apartments, villas etc? Typical prices for 2-bed, 2-bath apartment are 150.000; townhouses from 200.000; detached villas start from 280.000. Any tips and advice to people looking to buy in Benalmadena or surrounding area? Buy now before the prices increase and live life in the sunshine! Lisa, thank you so much for taking the time to help our readers with your experiences in Spain. If you want to contact her, you can find her details below. Here is an interesting tourist video on Benalmadena. Page Summary – This page contains unique content about the beach resort of Benalmadena, a popular tourist destination on the Costa del Sol coast of Spain. can we get a bus from Benalmadena to Gibraltar. How much does it cost and how often do the buses run and most importantly, can we get back to Benalmadena easily!! I love this newsletter even though I don’t live in Spain but am a constant visitor to the Costas. The information about areas is great for the visitors. It really makes you want to visit different places.